Kate Halsall, Sui's mum, 2017. Oil on basswood board. 27.9 x 30.4 cms. 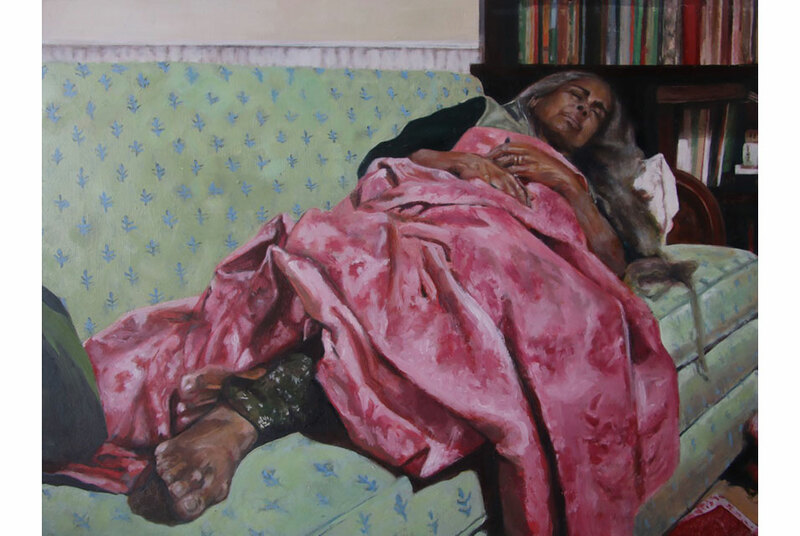 LONDON.- During the last year, painter Kate Halsall has embarked on a very specific project, to capture her subjects while sleeping. Artists have always had a fascination for the recumbent form of a sleeping figure, and the idea that something beyond our ordinary conscious self is revealed during the time we are asleep. In this series of twelve new oil paintings Halsall has gathered images of people who have found themselves asleep for a number of different reasons. Two children are tucked into bed, one assumes by their parents, a woman dozes on her sofa, a young tattooed man makes a mess of his blankets in the throws of a dream, and a man, caught napping during a party is curled up on the grass as if overwhelmed by sleep at the spur of the moment. Images of sleepers are about intimacy. But the intimacy we witness in these works is illicit, the moment of reverie captured without the sitters consent or permission, these stolen moments of observation are voyeurism, of course but are also tender observations, stolen views that exist out side the formality of a tradition portrait or planned sitting. Many artists through history have been inspired by the idea of the illicit observation. One of the earliest examples is the famous sculpture of the mythical figure Ariadne housed in the Vatican Museums in Rome. It depicts the daughter of the King Minos of Crete asleep after being abandoned by her lover Theseus. This sculpture, a Roman Hadrianic copy after a famed lost Greek original is one of the enduring images of antiquity. For Kate Halsall, her paintings have more in common with the art of the 20th century and the touching personal portrait paintings of Matisse. Her figures inhabit domestic interiors and private spaces not grandiose myths and legends: these are the friends who disappear at parties to be discovered later snoring in your bath tub or found passed out on the grass at a summer festival. The sleeping subject has also been a reaction to norms of conventional portraiture. In 1963 Andy Warhols film Sleep depicts poet John Giorno asleep for over five hours. The silent film, deemed by the artist as an anti-film, was the first video Warhol made and seeks to challenge the traditional convention of the painted portrait. For Warhol, this portrait of Giorno was a real portrait of the poet, and showed him in a more intimate and personal way. In Halsalls oils, several of these approaches to portraiture occur at once, they are about a stolen vision of intimacy, a private space and moment in time revealed, and also about the concept of what happens when you fall asleep, or dream, and seek to be a representation of the unconscious mind. Sleeping Portraits is Kate Halsalls first exhibition at New Art Projects.